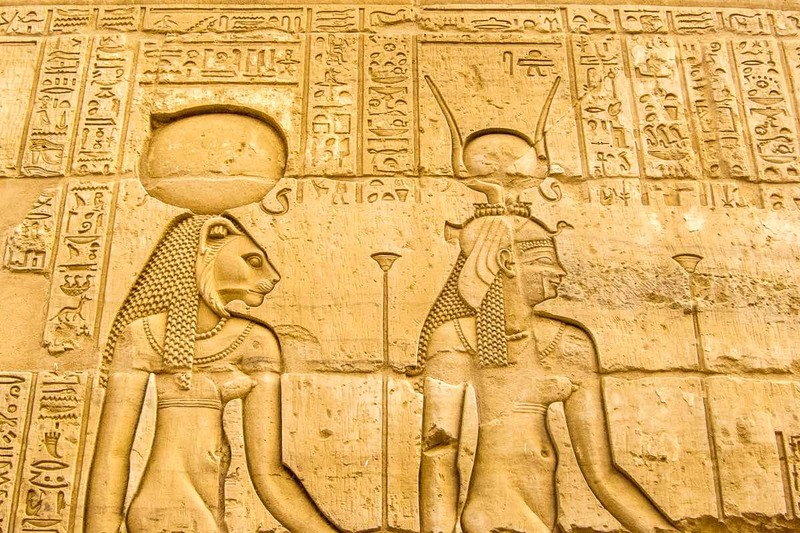 Buying travel insurance is one thing. Being able to access it quickly is another thing altogether. I’ve had an annual travel insurance policy for the past two years, but now I’m finally getting around to downloading and signing into the TravelSmart app by Allianz Global Assistance. I’m wondering why I didn’t take care of this sooner and feeling lucky that I didn’t have an emergency abroad in the meantime. Allianz originally released the TravelSmart app in 2013, but improved it substantially at the start of this year. I’ve recently downloaded it to my iPhone (yes, it’s available for Android, too) and registered, but I’ve not yet used the app while traveling. That will change with my upcoming trip to Greece, so I’ll use that trip to show how it works. Here are the highlights of the app’s features, with example how to use it. The TravelSmart app is free, and you’ll see some traveler-friendly tools here that useful whether or not you hold an Allianz travel insurance policy. The best feature, as far as I’m concerned, is that the app directs users to the appropriate emergency number in any of 130 countries. That’s right, 9-1-1 is not universal, and I’m fairly certain I wouldn’t remember the local country’s emergency number in time of need. 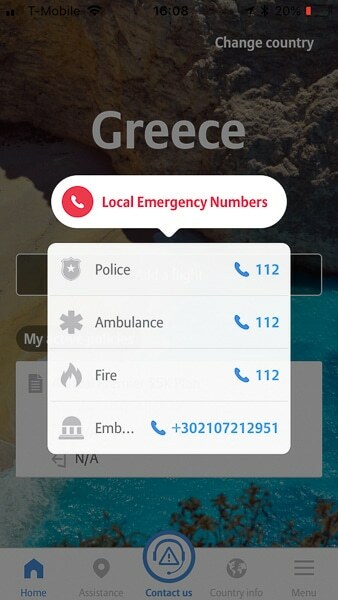 With the app, you’ll see the number that works for all emergencies: police, fire, and ambulance (1-1-2 in Greece). It also provides the U.S. Embassy number–in Athens in this case. All of these are direct dial by touching the number. Right on the home page, I see the name and number of my plan. Just clicking that takes me to a page that includes my coverage details, insured persons on my plan (Tom and me), and (this is cool) a copy of my policy in PDF format with a button to email myself a copy of the document. It works! And this is why each insured party should register for the app independently. This info is great to have on hand when, for example, your flight is delayed or cancelled. When you’re standing in the airport considering your next move, isn’t it good to know what your insurance covers? Be aware that this section shows the potential dollar amount covered, not a detailed explanation. Of course, I can refer to those coverage details in the 28-page document that I’ve emailed to me. 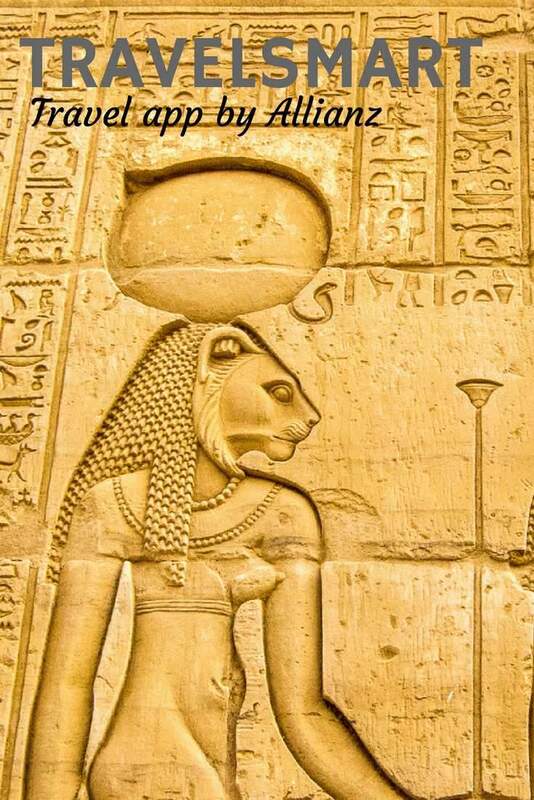 Even better, if you find yourself needing proof of insurance on your travels (some tour companies and activity providers require this), the policy PDF document is ready to present. One click takes me to the Assistance page, which in turn will look up nearby hospitals, pharmacies, doctors, and police, along with the embassy. 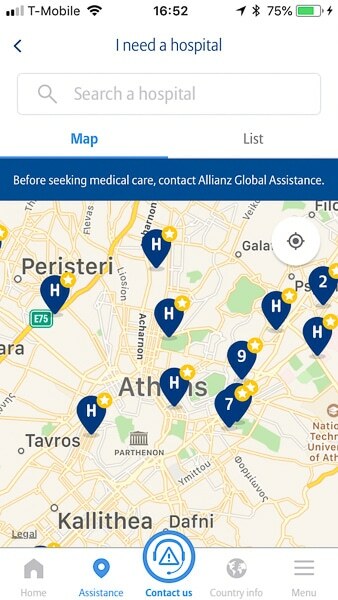 “This list covers facilities that have been reviewed by Allianz Global Assistance but may not include all facilities in the area,” the app will advise you. The last time I went to a doctor while traveling was in Israel, before I was insured. I made my choice by cross referencing a search ‘nearby me’ with an embassy listing. The TravelSmart app is a quick way to find providers you know will be OK with your insurance company. It’s advisable to enable location services when setting up your TravelSmart app. 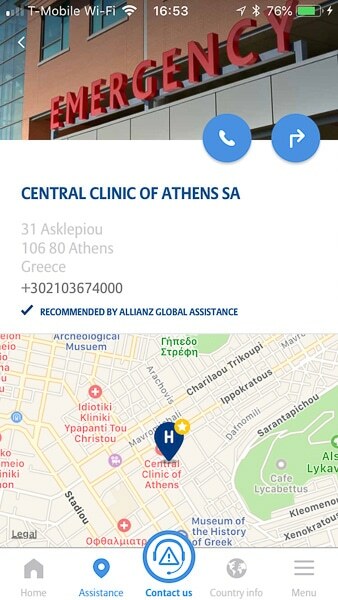 When using the app, it will know I’m in Athens, and search for hospitals near me automatically. To search Athens from Minnesota, I switched off location services, and then could zoom in on Athens and see hospitals and clinics in map or list format. Once a hospital or clinic is selected, the address and phone number appear, as well as buttons to call or map directions directly from that page. Note, you’ll also see a reminder to contact Allianz prior to receiving medical care. In an emergency that’s not required, of course, but it’s a good reminder. With any potential insurance claim, it’s best to be in touch with the policy holder early and often. Allianz’ TravelSmart makes it really simple to contact them: a central Contact button will offer phone connections for either your location in the U.S. or elsewhere internationally, and it includes an email button, too. We like to announce our issues before filing any claim, and preferably before taking any action. When you are ready to file a claim, you can do so from your phone app. I can’t share how that works, because when I tested “Edit my policy” and “File a new Claim” I received a message that the policy could not be found. I suspect this is because the app hasn’t picked up the start date of my insurance policy. Well, this is why it’s good to test things in advance. I’m not likely to file a claim from my phone, anyway. The flight status option appears to work only within two days of the trip, and I probably won’t bother with that. I already use Trip-It Pro to track flights, along with all my other travel arrangements. This section of the app will take you to the State Department travel pages for your select country. 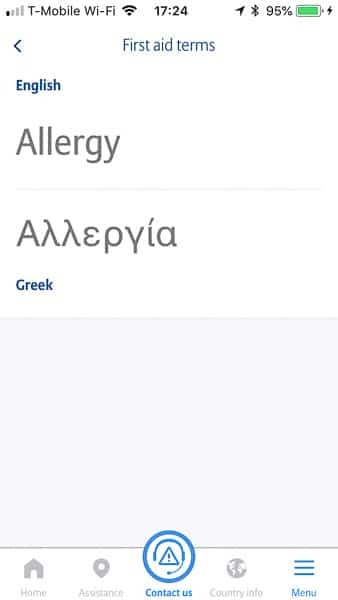 This includes the information you’d get when you sign up for travel alerts (any active volcanoes in Greece these days?) and provides the country’s basic info regarding passports, visas, vaccinations, currency restrictions, etc. All good to review before you travel. Go to the State Department’s helpful travel page if you want to investigate STEP (Smart Travelers Enrollment Program) on your own. The best use of the TravelSmart app is to download it and sign in before your trip. As with all travel insurance issues, the more you know in advance, the more transparent the policy, and the easier to access help in times of need, the better. TravelSmart app keeps your critical travel information and insurance details in a tidy package. Note: This is part of a series of posts we’re writing about travel insurance, a topic we get asked about a lot. The series is sponsored by Allianz Global Assistance, our provider. But we’ve selected the topics, such as annual travel insurance policies, and we’re writing from personal experience. Feel free to comment with your questions and your stories. Pin this story or share this post using any of the social media buttons below. This is great information. Travel insurance is really a necessity these days. Thanks, Vicki. It’s a handy app to have at the ready–for anyone with or without a policy. You’re right. Having travel insurance is just smart. Having your insurance policy on your phone is HUGE. We went on a tour a few months back and didn’t have our insurance policy info with us and it was a whole to-do getting a copy of it. And that medical translator could actually be a lifesaver. Right, Mike. It’s one of those things we don’t think we’ll need to access–until we do! Gotta love our smart phones!